A MARTIAL arts instructor from Bromley Heath has won two medals – at his first competition in 26 years. 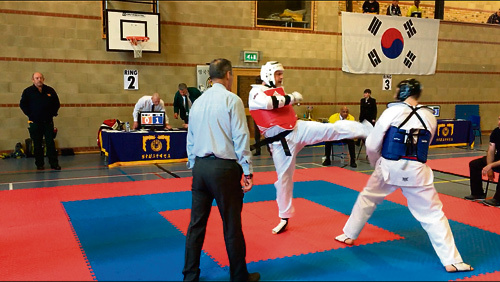 Mark Anthony James, of Queensholm Drive, picked up a silver and a gold medal in the full and semi-contact continuous sparring contests respectively at the 11th Annual Chung Do Kwan British Tae Kwon Do Championship, at SBL sports centre in Oldland Common. Retired electrician Mark, who is also a governor at Bromley Heath Infants School, has trained in WTF Olympic style Tae Kwon Do at Frontline Martial Arts school in Alveston for 30 years, and has been teaching for around 22 years. A 4th dan master in the sport, Mark also holds regular self-defence classes for women at the Church Centre in Quakers Road and is considering starting children’s classes there, too.